4. Contact those buddies to congratulate them. 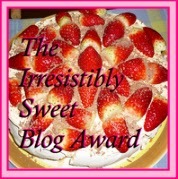 I'd be lying if I said I wasn't shocked - no one has ever called my blog 'irresistibly sweet' before!! And just look how yummy that award is! I-Want-That-Cake. Thanks, Vanessa @ Love, Laugh & Read for the very sweet award! Do check out her site, it's great!! ..coz if you pass along this one to people you'd get stuck in that vicious blog award giving circle! Lol, yes, that's one of the reasons!